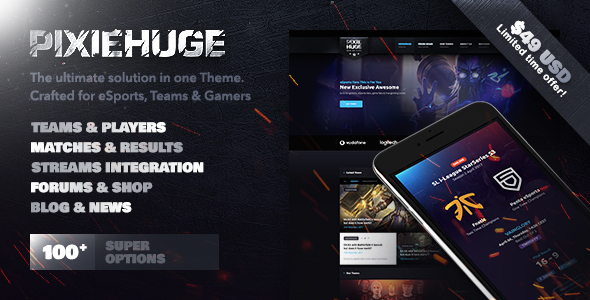 PixieHuge is a theme meant for eSports organizations / teams / gaming clans. The theme is built by the latest design standards in this industry, which brings the elite/premium feeling for the end user. This theme is based for a darker color scheme, which is genuinely more attractive for gamers, eSports fans. Same quality is guaranteed on all devices, doesn’t matter if it’s a tablet or a phone. PixieHuge offers the ultimate solution for everything one involved in eSports teams/organizations needs. It offers you to add unlimited teams, unlimited players, unlimited teams, to add sponsors, watch live streams, to keep track of matches. With this theme you can keep your users updated with the latest news articles, display multiple teams for multiple games. If your fans have a thing for your most popular players, they can keep track of them on their profiles. The theme can be customized with just a few clicks away. To use the theme you require zero code knowledge. Behind it is a state of the art admin panel, which allows you to manipulate the functions we have in stored for you. To learn how to use the theme is quite easy, just by reading our documentation and watch the awesome video tutorials. If that’s not good enough, make sure you ping us on our support system! If you love it, please don’t forget to rate it!